Nothing has changed as far as I can see. 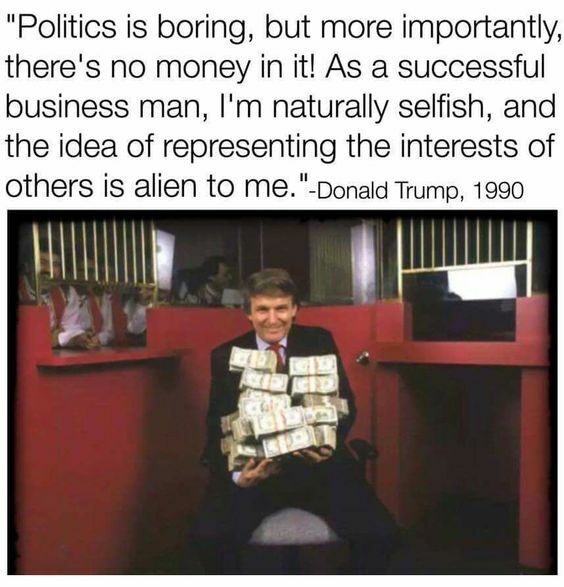 He’s still the same greedy, egotistical racist as he was in 1990. Oh, except that now he has the power to enrich himself and demonstrate just how little he cares for the rest of the people of this nation. Will we ever learn? This entry was posted in Hunger & Poverty, News & Views, Quotes and tagged alien, BLOTUS, boring, Donald Trump, egotistical, greed, greedy, money, politics, racist, selfish, wealth on December 31, 2017 by Ray Buchanan.